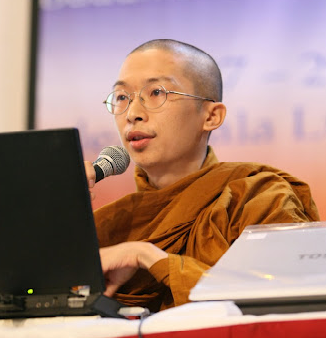 Āyasmā Kumāra Bhikkhu (1972- ; lay name: Liew Chin Leag, 刘振立) was ordained a Buddhist monk in 1999 at the age of 27 by Sayadaw U Revata at Subang Jaya Buddhist Association. Currently, he resides in Sāsanārakkha Buddhist Sanctuary (www.sasanarakkha.org), Taiping, Malaysia. He graduated with a bachelor degree in education (Teaching English as a Second Language) from the University of Malaya. It was during his studies there that he became enthusiastic about the Buddha’s teachings and decided that he wanted to live this life as a monk. Since then, with his training in education, he has been sharing the Dhamma in various ways and in several languages (mainly English, Mandarin and Hokkien) with Buddhists of various traditions and non-Buddhists too. Inspired by Sayadaw U Tejaniya (www.sayadawutejaniya.org), his main meditation teacher, he is interested in cultivating wisdom that removes the causes of suffering. He is also influenced by Āyasmā Aggacitta to be open to Dhamma teachings beyond orthodoxy and tradition, so long as they work towards the ending of suffering. Having found his way, he is happy to help others do so too. This page was last edited on 30 August 2018, at 01:51.